When visiting Vietnam, Ho Chi Minh City (Saigon) is a must do big-city. It's a beautiful and busy city with a lot of cultural sites. You'll find groups of students and teachers sitting in the parks willing to speak English with you. They are eager to learn from tourists, but they might be really shy too. Walk around town, visit some street markets and get lost in the small connecting alleys to experience the real Saigon. In the Pham Ngu Lao Area it might be a challenge to get rid of street vendors in a polite way, especially when you're having a sit-down meal. The Cu Chi Tunnels where also on the list, but once going through the entrance tunnel I realized I picked the wrong one (Ben Dinh instead of Ben Duoc). From the entrance up to the end everything is well organized, but way to touristy if I may say. From the shooting range, themed bins (they look like trees), fake green grass to the souvenir shops, the historical part is a bit lost. The worst thing is that there a huge investment plans to make it an even bigger 'park'. If you visit these tunnels ask/pay for a private guide, because otherwise you might also get a big group that needs to take the same picture at every tunnel entry. Have great Indian food at Baba's Kitchen. Forget to visit Ben Thanh Market, go early mornings so it's not too hot inside. 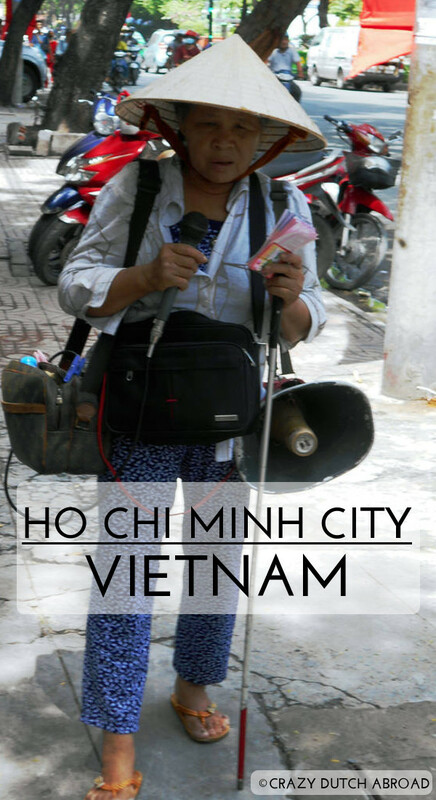 A blind woman singing in the street for some money. Wet towels on your table will be added to your bill. Saigon Skydeck, nothing but great views! Making fresh spring rolls (Goi Cuon) at Que Nha. Ben Dinh Cu Chi Tunnels. Click here for Phu Quoc! Click here for the Mekong Delta!